Just Who's Watching the Watchdog? Better Business Bureau: Legal Extortion or Consumer Advocate? BBBS rating is based on 16 factors. BBBS does not have sufficient information to determine how long this business has been operating. BBBS made one or more requests for background information from the business. BBBS has not received a response from this business and/or has not been able to verify information received from this business. 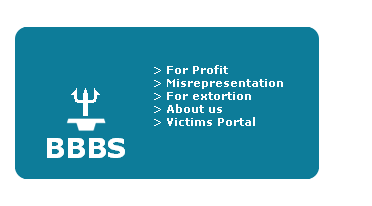 BBBS does not have sufficient background information on this business. BBBS made one or more requests for background information from the business. BBBS has not received a response from this business and/or has not been able to verify information received from this business.